Two million-year-old blood and fat on stone tools found in South Africa are giving clues about what hominids ate and how they lived, says an Australian researcher. Molecular archaeologist, Dr Tom Loy of the University of Queensland, reported his analysis of biological residues found on quartz stone tools at a recent ancient biomolecules conference in Brisbane. "I looked at them and there was blood everywhere," Loy said of the tools, which are among the oldest of their kind, and came from the Sterkfontein caves 60 kilometres northwest of Johannesburg. Loy found intact and fragmented red and white blood cells; fat cells from bone marrow; collagen from ligaments and tendons; muscle tissue and even degraded hair on the tools. He also found residues of wood, keratin from the scraping of horns and starch grains, which he said was from a plant that still grows in the area. "They were eating meat and tubers," Loy told ABC Science Online. "The residues on the stone tools tell us what hominids ate, what kind of tools they made: those from horn, wood and bone," he said. "We didn't know any of this stuff before." Loy said the so-called Oldowan tools also gave clues about hominid sophistication. While the tools were rudimentary, with a one-sided blade and little ornamentation, they were specialised for working with different materials, such as bone. Loy said a few pieces of worked bone had also been found at Sterkfontein. "The thing that differentiates humans from any other organism is our ability to think three steps ahead. Clearly [the hominids] were thinking ahead," he said. "A hominid takes a rock, makes or finds the proper edge, then goes off and finds a bone and then works the bone to make it into a tool for something else. To me that's 'sapiency', that's human, even though they were only four feet high and had a third of our brain." Loy said his findings also challenged the idea that the hominids scavenged meat but didn't hunt. "The most common reconstruction of hominids is small family units wondering around the countryside hiding in caves and trees at night to stay away from predators and scavenging, eating nuts, insects, seeds and occasionally grabbing some meat off a dead animal." But Loy said the blood he discovered on the tools indicated that it came from freshly killed animals and that this was most likely to have come from hunting since hominids would have stood little chance of competing with other hunters or scavengers. "I can't really see a bunch of little hominids driving some lions away from a kill or driving vultures off," he said. To identify the residues on the stone, Loy made replica tools and used them on a variety of materials. He then studied how the proteins and other molecules in residues from the materials behaved over time on the stone surface. This allowed him to identify similar patterns on the tools when viewed under the microscope. One interesting residue component was the common blood protein serum albumin. Loy found that the protein quickly unravels and cross-links while blood is still liquid, forming a tangled matrix. He also found that silica in the surface of the stone tool causes the protein to bind to it, anchoring the matrix and stabilising it. This binding, he said, would have ensured any residues remained on the stone tool over millions of years. Loy said the residues have also been protected from degradation by clay from the soil that coated the tool as it was thrown onto the ground. He said the clay coating and rock surface 'sandwiched' the blood proteins and prevented them from degrading due to oxidation and exposure to water or microbes. "The clay protects the blood residue for ever as long as the soil chemistry doesn't change," Loy said. "One haematologist I was talking to said 'It's like these things have been freeze-dried'. And that really is the case." But U.K. biochemist Dr Matthew Collins from the University of York, who specialises in protein degradation, is sceptical of Loy's findings. "Because I haven't looked at his material I can't say it's wrong but I find it surprising," he told ABC Science Online. While Collins said he had not looked specifically at residues on stone tools, his research had shown that in climates like Sterkfontein's proteins wouldn't last much longer than 100,000 years. 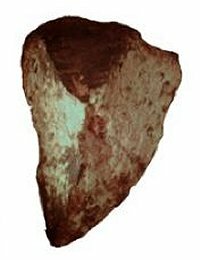 But Loy said Collins was not taking into consideration the special circumstances that had preserved the residues in the Sterkfontein tools.